I am confused The Thorn Sherpa frameset that I just built up has all sorts of braze ons and eyelets. Most of them I am okay with but the dynamo bosses are confusing the Hell out of me! On the Right Hand fork leg are the bosses. When I look at Bottle dynamos on the internet they all talk about right and left ones. Does that refer to which side of the forks they go on or is it to do with the bottle being to the left, or right, of the bracket it comes with? Bosses are, as I say, on the right hand fork leg. Do I need a left hand dynamo or a right hand one? Well, when I bought a Lightspin bottle, I'm fairly sure it was labled LH and that is where it went, at the front of the forks. But when I transfered it to a bike with a rear fork mount, it went to the right. Hope that helps. Looking at the bike from the side, if the dynamo bracket is on the left hand side of the fork, you need a left handed dynamo. If it's the right of the fork, then you need a right handed version. If the boss is on the right fork then it's a RH dynamo you need and it goes in front of the fork. I would give St John Street Cycles a call if you are at all unsure. My Pashley has similar bosses on the inside of the LH fork, and I used the Type 3 L-shape X-long bracket to mount an LH Dynamo. and I can recommend the Nordlicht 2000 Dynamo too, but replace the rubber wheel with the steel one. Thanks folks! I spoke to SJSC this morning. The braze on is at the rear of the right hand fork leg. If you look at the bike from that side it is to the left of the fork. SJSC tell me that I need a Left Hand Dynamo so that's good enough for me In the past I've always used SON hub dynamos but finances will not allow that this time. While you can mount the dynamo backwards, ideally the dynamo should be positioned ahead of the mounting point. In other words, if mounted on the fork, the dynamo should be in front of the fork, not behind it. In case the mount should come loose, the dynamo could jam between the spokes and the fork blade if it's mounted behind the fork blade, If it's mounted in front, it could bounce around some, but it's not likely to jam and cause a crash. Similarly, if you will be mounting the dynamo to the seat stay with the Dynamohalter, it should be positioned ahead of the seat stay, within the triangle formed by the seat stay, the seat tube, and the chain stay. You can position it behind the stay, but you take the risk should the dynamo come loose. Right or Left Side Mount? When ordering your dynamo, you'll need to specify right side or left side mounting. The dynamo itself, (not the mount you purchase separately), is built specifically for either right side or left side mounting. And since this assumes the dynamo will be positioned ahead of its mounting point, those who choose to mount the dynamo to the rear on the right side, should choose a left side mount, since of course, everything is in reverse. For instance, if you're mounting the dynamo on the right rear seat stay, ahead of the stay, within the rear triangle of a standard bicycle frame, you would use a right side mount. But if you choose to place it behind the right seat stay, you would use a left side mount. If this doesn't make sense, don't hesitate to ask about this when you place your order. Thanks Kim, that shows it easier for me. It seems like SJSC expect the dynamo to be mounted behind the fork on the right hand side of the bike so I need a Left Hand Dynamo.. I think! That's how I'd read it too. Left-handed dynamo, running 'backwards'. I'd agree. My pink magenta bike had a dynamo mount on the rear of the right fork. The advantage is that the dynamo wheel tends to get drawn towards the tyre, reducing slip. The downside is, as Kim's link suggests, if it works loose the sudden halt to your proceedings may prove painful and/or worse. I think I've got the bottle dynamo I took off the magenta bike in my bits box (I've gone over to a hub dynamo). Do you want it? The downside is, as Kim's link suggests, if it works loose the sudden halt to your proceedings may prove painful and/or worse. The same applies to sensors for computers, although if they're wireless they'll probably just bounce out anyway. Those aren't a source of vibration, so would seem less likely to work loose in the first place. Plus I expect the average computer sensor/cable/zip tie arrangement would simply break if it were to become entangled in the spokes, while a dynamo is a substantial lump of thing to get wedged. On the other hand, a bottle dynamo would be inspected for wobble every time it was deployed/retracted, so hopefully if it were working loose, you'd notice. I think you're optimistic on the dynamo deployment = inspection front, but otherwise I'm broadly in agreement. In fact, I do remember my Cateye sensor, which is fairly bulky for a wired one, becoming loose many years ago - it was quite new and I think I simply hadn't glued it properly - and it did just bounce around making a horrible noise. It was a bit scary, but nothing actually happened. Well. I didn't take his advice. And then I spec'd a frameset from another builder - with a bottle bracket at the back of the right fork. Problem was, when I received that frameset, I really really didn't look the like of the brazing of that bracket. There wasn't enough brass filler shouldering the bracket to the fork (there was under-hang of the filler), which would increase the stresses going through the joint. The builder didn't seem to agree, BUT STILL changed the whole fork, so fair enough. The replacement shouldering was much, much better - but should have been like that in the first place IMO. The point is, you do take a bit more risk in having the bottle on the rear of the fork. I suppose That was doubly so, having a Lightspin bottle, which is perhaps twice the size or weight of a regular bottle. I'd need some sort of a "Clamp On" bracket for putting it on the seatsays I assume? I can't see Thorn building their forks with a potentially weaker setup, they are a Big Name with a reputation to keep. If Thorn give you bosses on the front fork, I would use them. It makes for a very neat installation especially if you're only running the front lamp off it (as I do). Thanks for the offer Tim but I've found another good YACF type that is letting me have Shimano hub dynamo for a light smattering of Earth Pounds. I think the traditional place to mount it was in front of the left seat stay, ie inside the left side stays and seat tube triangle, that's where the dynamo braze on is on my frame. The mounting tab of the dynamo would stick out to the right if looking at it standing to the left of the bike, is that why it's called "right handed"? I remember getting one years ago and I don't think there was any mention of it being right or left handed. 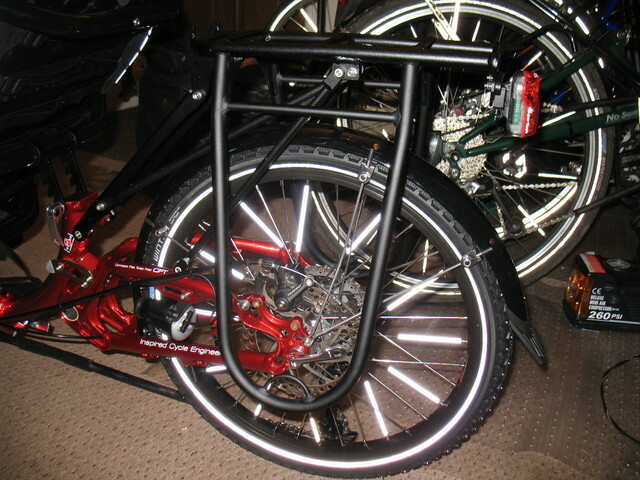 But difficult/impossible to use with panniers, and would make carrying panniers difficult/impossible even in daytime. I have a bottle dynamo question: do you really want to use one, bearing in mind how light and cheap-to-run battery lights are these days, or how much better dynamo hubs are if convenience is the main factor? I don't use one anymore because they slip in the wet. Main reason for me is simply safety. I'm looking at it for the tourer and the idea of having a guaranteed light, away from batteries, lights nicked or similar, means that I can relax and know I have the necessary's.